The Eaton coalescer/separator is a two-stage vessel designed for separation of liquid in the form of a fine mist or fog from a gas or vapour. The Taiwan-based manufacturer believes that it has the most computer numerical control (CNC) machines in the world. Computer numerical control was introduced to the machining industry in the early 1970s. It has since revolutionised the way various metals are milled, lathed, drilled, cut and polished. The most basic function of any CNC machine is automatic, precise and consistent motion control. Rather than applying completely mechanical devices to cause motion as is required on most conventional machine tools, CNC machines produce motion control via computer programming. All forms of CNC equipment have two or more directions of motion, called axes. These axes can be precisely and automatically positioned. The CNC machining often uses lubricants to help diminish the high levels of heat typically generated in the process. Another downside is the vaporisation of coolant, which often produces an airborne mist or haze. Though not believed to be a serious health hazard, the haze can make breathing uncomfortable and irritate eyes. In addition, the mist cannot be released into the atmosphere according to local environmental protection laws. Doing so would result in substantial fines. Corporate sustainability mandates would also be compromised. Eaton's customer was relying on an old and ineffective air ventilating system that consisted of a scrubber and plasma treatment equipment. Becoming increasingly more ineffective over the years, the two-step arrangement was also consuming huge amounts of water. That same water was being contaminated with oil residues and had to be transported to sewage treatment facilities. Meanwhile, the plant air quality did not improve. Costly, dirty and encumbering quality, the system that kept tools and metals cool and lubricated needed to be replaced. Eaton Filtration was recently summoned to clean up the mess. An Eaton gas/liquid separator was installed to replace the outdated system to clear the air inside the manufacturing facility of that unpleasant mist. 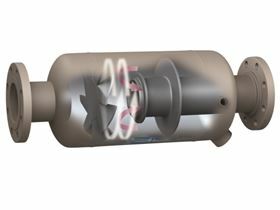 A 32-inch Type 35L-CLC was selected for the application, which is capable of removing up to 99% of oil, water and other particles more than four microns in size. The self-contained two-stage design of the system functions by, first, increasing the size of liquid droplets through a wire mesh de-misting pad in the vessel's container. Next, the droplets are centrifugally thrown to the outside wall and flow to the bottom of the vessel for draining. The Eaton gas/liquid separator also prevents the drop-lets from being re-entrained after separation. High efficiency of oil mist removal. No media to be disposed. Eaton boasts one of the world's largest inventories of filtration products. Designed for efficiency in a variety of demanding markets, applications, and environments, Eaton's line-up of filters includes pipeline basket strainers, mechanically cleaned filters and strainers, tubular backwashing filters, filter bags and bag filter housings, filter cartridges and cartridge filter housings, gas liquid separators, depth filtration, as well as hydraulic and lubrication oil filtration solutions to help optimise filtration performance, quality and plant productivity. After installation, oil mist/haze has been reduced to a minimum in the workshop, exhaust is meeting the necessary environ- mental standards, and the grease from the cooling liquids can be reclaimed and reused – an added benefit that was not possible with the old system. Because no water is used with the Eaton separator, filtration costs have been reduced substantially, as have associated transport and disposal costs of contaminated water. Employees at the site are also benefitting with cleaner, healthier working conditions, and Mother Nature is pleased by the absence of harmful emissions and water contaminates. That's precisely what the company wanted. Pentair and Urban Organics are opening a new, 87 000 sq ft indoor aquaponics farm in St Paul, Minnesota, USA.